Take advantage of new developments in instrument and software design. Take full advantage of the new performance specifications offered by the improved electronics and 32-bit Exponent software. 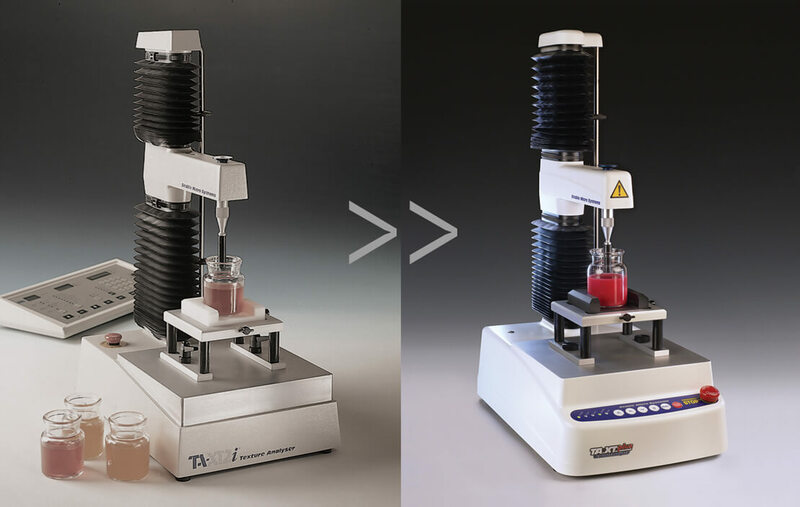 At the same time, protect the initial capital investment of your original texture analyser purchase. A standard facility of the TA.XTplus is the ability for the user to develop and write their own unique test procedure or “sequence”. The number of these sequences that can be produced and their complexity is limitless. What ever you want the texture analyser to do is now possible without being limited by standard library tests. Designing your own test method is made extremely easy and user friendly by using the Sequence Wizard provided in the 32-bit software. The technical specifications of the TA.XTplus will allow more accurate analysis of products at all sorts of speeds. Test speeds can be varied between 0.01mm/s up to 20mm/s with greater distance resolution. Data recorded during product testing can now be run at 500pps for longer timespans allowing for more precise analysis. Revised electronics allow accurate reporting of errors and the ability to update the firmware via flash upgrading from the internet. The software is also still constantly being improved and free updates will be available for downloading from our website. In addition upgrading will extend your instrument's warranty by an additional year. The capability of Exponent software for users engaged in research is constantly increased by the addition of testing procedures, presentation formats and analytical solutions. However, many users in QA or in a high throughput production environment require simpler test and data analysis solutions. Exponent Lite has been introduced to accommodate these requirements. Exponent Lite, compatible with both TA.XTplus and TA.HDplus instruments, enables simple texture analysis by offering flexibility and simplicity of use without loss of accuracy or performance. Users at all levels will appreciate that minimum learning and training is required whilst providing all of the capabilities to run tests quickly and efficiently. Operationally, it is almost identical to Exponent but the complexity required by advanced users has been removed. For information on the TA.XTplus, Exponent and Exponent Lite and their many new features, please click here or contact your local sales team directly.